Telesto [tah-LESS-toh] and Calypso [ka-LIP-so] are called the Tethys Trojans because they circle Saturn in the same orbit as Tethys, about 60 degrees ahead of and behind that body. Telesto is the leading Trojan and Calypso is the trailing Trojan. Both were found in 1981 by B. Smith through ground-based observations made in 1980. Telesto is 34 by 28 by 26 kilometers (21 by 17 by 16 miles). This is the highest resolution image yet taken of Saturn's moon Telesto, which shares its orbital path with the much larger moon Tethys. Telesto is 24 kilometers (15 miles) across. Telesto has a potato-like shape. Overall the surface appears to be fairly smooth with a number of craters present. 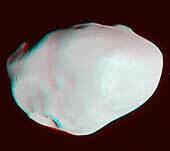 This is a never before seen 3D image Saturn's moon Telesto, which shares its orbital path with the much larger moon Tethys. Telesto is 24 kilometers (15 miles) across. Telesto has a potato-like shape. Overall the surface appears to be fairly smooth with a few craters present. The image was taken with the Cassini spacecraft narrow-angle camera on October 11, 2005, at a distance of approximately 16,234 kilometers from Telesto. These views show surface features and color variation on the Trojan moon Telesto. The smooth surface of this moon suggests that, like Pandora, it is covered with a mantle of fine, dust-sized icy material. The monochrome image was taken in visible light. To create the false-color view, ultraviolet, green and infrared images were combined into a single black and white picture that isolates and maps regional color differences. This "color map" was then superposed over a clear-filter image. The origin of the color differences is not yet understood, but may be caused by subtle differences in the surface composition or the sizes of grains making up the icy soil. Tiny Telesto is a mere 24 kilometers (15 miles) wide.